Ascend is ever the fairy tale ending to Amanda Hocking's Trylle Trilogy. Though Wendy's life isn't full of extravagant balls or gowns, she gets her fair share of romance and experience as the Trylle princess. With the risk of danger in every decision Wendy makes toward saving her people, she has to rely on her training and friends if she wants to come out alive. 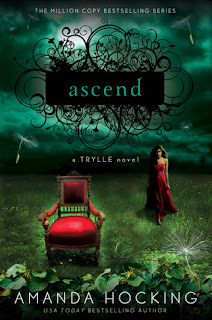 Ascend is the most suspenseful of the three Trylle novels. Not knowing what will come next for Wendy and fearing that the Trylle and Vittra will end up in war will surely put readers on edge. The suspense even extends to Wendy's personal life as she swivels between marriage to one of her closest friends, or loving freely the man who may very well be the love of her life. If not for the steamy and adorable romance, Ascend would be only pages and pages of political intrigue and heart-stopping action. All great series must come to an end, but at least Hocking closes the Trylle Trilogy with a big bang. Readers will certainly be pleased with Ascend's unexpected surprises and long-lasting triumphs! Happy to have your opinion of this series. I have been eyeing it in the store but was hesitatant because I don't read "straight up" romances. I like books with action, suspense and a good bit of danger and mystery. Looks like i'll be giving this series a second look.